One of the most underrated skincare products is hand cream – we all know they are the first place to show your age, so keep ‘em looking young and you’ll have them fooled! A good hand cream is always hard to find however, and if you’re like me and love a combination of great fragrance, high performance and a non-greasy feel (I keep them in the car) then it’s that much harder again. Having said that they do come around every few years, and New Zealand skincare company Savar’s Advanced Hand Repair is most definitely one that ticks all of those pesky boxes. The press release that company founder Vicky sent me begins: “A good hand cream is a luxury. One boosted with anti-ageing ingredients and natural non-inflammatories is not only a treat, it’s a necessity”, and I have to agree! Does her product deliver? Absolutely, and the slick, clean and very portable packaging is an added bonus. It contains a wide range of premium botanical extracts and oils to help soothe the skin and protect it against damage, including New Zealand avocado oil, organic violet and lime flower, and the premium ingredient line up makes not only makes this top-rated hand cream a balm for dry and sensitive skins, it also helps to soothe conditions such as eczema and psoriasis. Being an eczema sufferer this gets major thumbs up from me, and means that it will be an absolute saviour once the temperature drops. 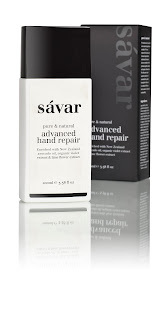 This beauty is available at www.savaronline.com and from selected leading retailers and beauty therapists for RRP $38.00. So worth it!